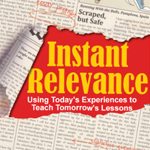 On the 17th episode of the Instant Relevance Podcast, Denis Sheeran (@mathDenisNJ) and Raymond Steinmetz (@blended_math) discuss a #MakeItReal mini moment about re-purposing things in the classroom. What is it that you really want to happen in your classroom, but you might need to find a new way to get there? Follow the conversation and learn from others on Twitter.